Over the past week, the fast food restaurant chain Taco Bell was sued for claiming that the taco mixture used in their products was actually beef. 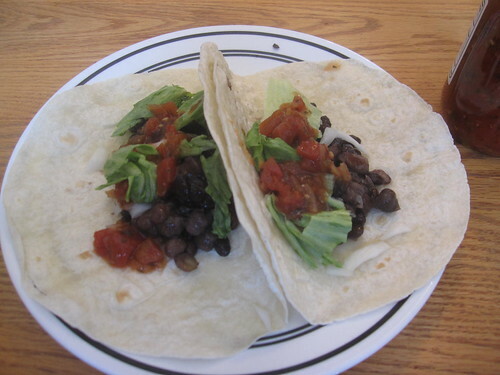 According to USDA standards, a beef mixture served by businesses must contain at least 40% beef in ordered to be labeled as such, and the lawsuit alleges (with some evidence) that their taco mixture only contains 36% beef, not the 88% beef that they claim. If you start digging into the standards for what can be labeled as particular foods, the issues get quite disturbing. Check out this article in which it’s revealed that the standards for meat in school lunches are lower than the standards for meat in fast food. 2)Goverment regulations, which do not always have the best interest of the consumer in mind. This goes for not just food, but for all manner of things from toothpaste to makeup to even product placements in television and film. For comparison’s sake, I took a look at Taco Bell’s value menu. 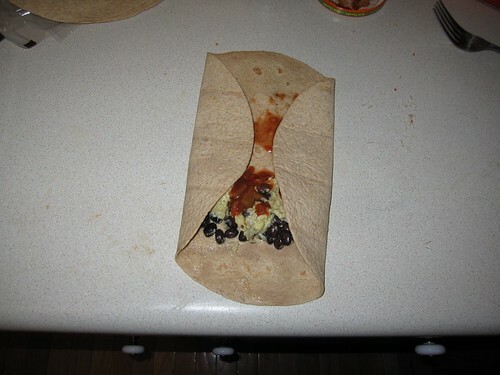 An $0.89 value menu five layer burrito there – which you’ll also have to pay tax on – weighs 248 grams. In the picture above, you can see my homemade bean burritos. I weighed one of these out of the freezer (because I have several frozen). The weight? 340 grams. It costs $0.20, while you’re dropping $0.95 at Taco Bell. What about something “better”? 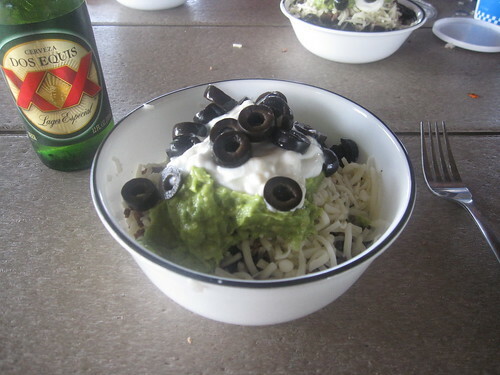 I compared Taco Bell’s Chicken Ranch Taco Salad with our own burrito bowls, pictured below. 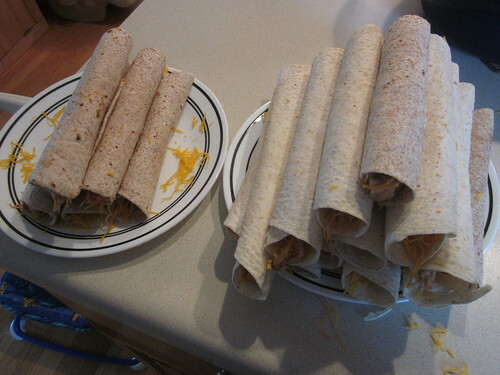 The Taco Bell salad weighs 420 grams, while my homemade one weighs about 470 grams (excluding the bowl). The homemade one costs $2.25, while the Taco Bell version costs $5.69 plus tax, carrying the price up to $6. And think of the “meat” you’re getting in that “bargain”! Stick with the most basic ingredients possible and exert the most control you can over those ingredients. Be picky about the ingredients you buy for your food – don’t just settle for whatever prepackaged meal has a tasty picture on the box. Be picky about what you watch on television – don’t just settle for channel surfing (or, better yet, read a book from the library). I think it’s fairly clear at this point that there are huge cost savings that can be found from being more involved in the things you consume. The biggest challenge facing everyone is the issue of time and convenience.People eat at fast food restaurants because it’s convenient and it takes time to prepare your own food. People channel surf because it’s convenient and it takes time to prepare other entertainments. The phenomenon of convenience comes down to time and energy bottlenecks. I see this in my own life. Weekdays are often very tight, with both Sarah and I needing to get professional work done, three young children to attend to, and regular household upkeep as well. The convenience of simply eating a premade meal or watching whatever television program happens to be on is very tempting simply because it allows us to conserve energy and time for other purposes. At other times, though, we have large windows of time. It’s in those time windows that there’s a lot of value in improving the options during those time bottlenecks. I’ll find good programming to watch and add it to the Netflix queue so I don’t have to think when I’m bottlenecked – just click and go. I’ll prepare healthy food with good ingredients in advance so I don’t have to exert a ton of energy or thought when we need a meal – just toss it in the oven and go. Such actions enable me to enjoy convenience without losing quality. I can have food quickly without having to eat “meat.” I can watch something worthwhile without having to surf. This spreads throughout life. The same philosophy explains why it’s worthwhile to install a programmable thermostat (it saves you money whether you’re pinched for time and energy or not) or air seal your home. In the end, if everything else evens out, if you consistently consume healthier food, you increase your chances for good health throughout life. If you consistently entertain yourself with things that challenge your mind (at least gently), you increase your ability to think through situations as well as having a warehouse of knowledge that can help in many situations. You’re rewarded with lower health care costs and greater long term earning opportunities. Convenience can be a very good thing. It can help us survive some of the time and energy bottlenecks that modern life foists upon us. The problem with convenience, though, is that it can often lead us into overcosted and questionable choices like Taco Bell’s “meat product” featuring silicon dioxide. Yum. We can combat this by simply planning ahead a little bit. Turn on some music this Saturday and make a batch of burritos for the freezer so you’re not left with a fast food stop this week. Install a programmable thermostat so you don’t have to remember to adjust the thermostat every time you go to bed, get up, or leave for work (and you’re not paying for it if you forget in a bottlenecked period). Seek out some documentaries or other programming on topics that really excite you and record them so that the next time you flop on the couch, you can just hit a buttion and watch something fulfilling instead of channel surfing through a wasteland. You save money. You eat healthier. You don’t lose convenience. And you’re not left eating “meat product.” It’s a win all around.